If you forget your password, you can click the Forgot? link on the TouchPoint login page for your church’s database. Enter the email address on your record, and you will receive an email with your username. It will be a link that you will click to set your password. If you do not remember your username, you can always login using your email address and password. Also, once you are logged on, you can change your password at any time. 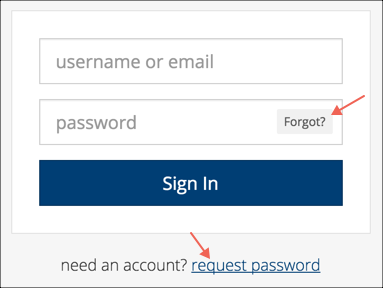 If you do not have a user account already, or if you do not remember if you have an account or not, you can click the Forgot? link or the Request Password link and create an account. If more than one person has the same email address in the database, an email will be sent to each of them who are over the age of 16 (or old enough to have a user account). Also, if you already have an account and you click ‘Request password` that is OK. You will still receive an email reminding you that you have an existing account. The email will contain your username and a link to reset your password. When you click either of the links mentioned above, you will be asked to enter the correct Username (if you already have an account) or email address (to create an account or if you do not remember your username). The system will send you a link which allows you to create the new password right there. Once you create the Password, you will be logged in and can proceed to your Homepage. This is very fast and easy, but is also secure. The link will be a one-use only link and will expire if not used within 24 hours. Anytime a link is sent to set a password or reset a password the link will expire in 24 hours. If you want to extend the time before a link will expire you can change that in Administration > Setup > Settings . The setting is named ResetPasswordExpiresHours. If you click the link and do not set your password at that time, you will not be able to use the link again. That counts as the one-click use. If you do not receive an email when you click either link mentioned above, it could be one of two reasons. We do not have that email address in the database and you should contact the church. Your email provider sent it into your spam or junk folder. Look in the folder and then click “Not Spam”. If you have problems, contact your church’s TouchPoint system administrator. If you use either link mentioned above and enter an email address and we do not find that address on a record in the database, you will not see a message on the screen telling you that we cannot find your email address or username. That is because we do not want anyone to be able to change your password except you. If we displayed that information when someone uses those links, it would give the bad guys information they could use to hack into our system.